I recently (well... Quite some months ago now) stumpled into the race while reading a out various wolfdogs. I was fond of the idea of a dog that looked like a wolf without being one. The issues with hybrids concerned me, so discovering the Tamaskan I became a fan immediately. In half a years time I will have finished my degree, and so I am considering getting a dog sometime in summer/fall 2018. Welcome to the International Tamaskan Forum. I've provided some useful links below. If you are considering bringing a Tamaskan Dog home summer/fall 2018, start reaching out to breeders now. Waiting lists for many breeders are at least a year. 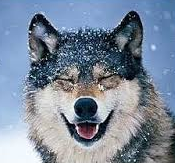 It sounds like you might be looking for a Tamaskan with little or no wolf content. I highly recommend talking to several breeders to find out more about their lines. Some lines/litters have content of various percentages. Good Facebook groups to join: Tamaskan Dog - Debate and Discussion, US Tamaskan Dog Club, and All About Tamaskans. Hi Jadzia, thank you for the welcome and advice! I will make contact to some of the real breeders then. I do not have Facebook unfortunately, otherwise I would also check out the groups you mentioned. Hi Peter, welcome to the forum! Sorry for the slow reply but I hope you enjoy your visits here.